Submitted by Dave Hodges on Wednesday, April 10, 2019 - 12:37. The dots are beginning to connect to the Aztlan plan and the CALEXIT movement. At the heart of it is George Soros. However, many prominent members of the former Obama administration are participating as well as California's past and present governors. The goal is to remove California from the United States and collapse the economy. And they will do so by any means possible. According to Paul Preston, reports are coming in that numerous state legislators from California, including "California Senate pro tem Kevin De Leon, State representatives from Florida, Texas, New Mexico, Arizona, Nevada, Utah and Colorado have been meeting with members of La Raza, the Mexican government (consulate), Mexican Mafia (La California's violent Mexican gang Nortenos/Surenos/ Sur 13, La Familia and leaders of the Catholic/Jesuits church. They all have come up with a plan to separate California from the US. In addition to what Paul Preston revealed as to the brains behind the Calexit movement, he revealed that he has a man on the inside, let's call him "Mike", as Paul Preston calls him. "Mike" not only reported on the attendees of these Calexit meetings, this insider reports CONFIRMED the former Obama administration has had three members in attendance and the administration is in support of this movement. Again, this point cannot emphasized too strongly. Need I point out that this man's life would be in grave danger if it were discovered that he was a plant and reporting to the Independent Media?Therefore, his identity will never be released. At the time I interviewed Paul, he was gravely concerned for the fate of the insider. At the time that this interview was conducted, "MIike" as Preston calls him. was two days overdue for his check-in. Please review the list of participants and you will quickly realize Preston is concerned about the safety of "Mike". The La Raza movement seems to be at the core of this movement. However, the original movement has morphed in its scope and implementation. As revealed in their meetings, if CALEXIT is unsuccessful and the Deep State movement is backed into a corner, extreme mass violence against whites and black street gangs will be initiated. We are beginning to link the Vegas massacre to this movement as revealed by "Mike". The Vegas incident is becoming increasingly viewed as a beta test for the fail safe, mass-murdering plan of the CALEXIT movement. And the Mexican cartels are lying in wait to fulfill their Reconquista plan. The Chinese will have access to California's agriculture and water on a larger scale, the UN will succeed in wreaking economic havoc to America's retail traffic and agricultural supplies by neutralizing California. Won't happen. 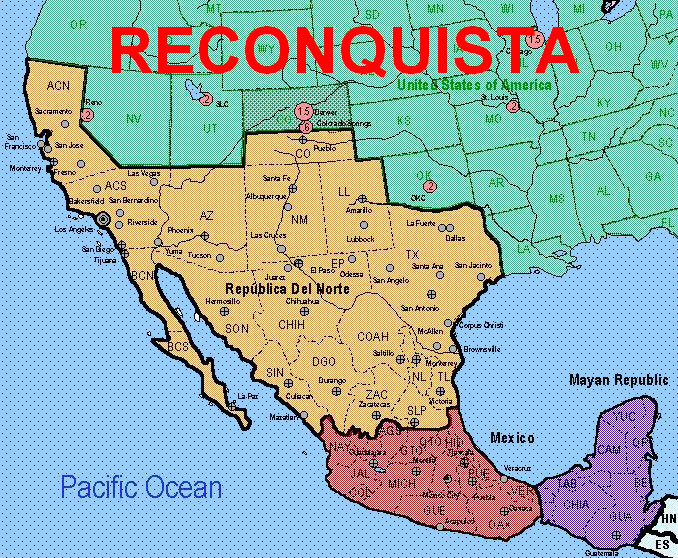 The Aztlan movement is a small group of brown supremacists. California and Texas will be independent before they revert to Mexico. By itself CA is the 7th biggest economy while Mexico is 14th. Why join a losing team? The Texans are very independent as they fought two wars of independence: 1 Mexico 1836 2 the USA 1861. As to the Catholic Church, 40% of Central America is evangelical Christian and growing. Central Americans hate Mexico and the Catholic Church. Fear the Chinese most. Well.. I'd like to agree with you there but the cajones it took then to fight this off has now been sissyfied and neutered. Endless feminism, arrests, conditioning , with women, children, and eunich cucks running everything, the enemy is just going to bull through this B.S. All the above listed will be happy to have masculine men running things even if they are abusive. We have an invasion on out borders like the hapless Western Europeans and do you see men doing anything to assist the POTUS?